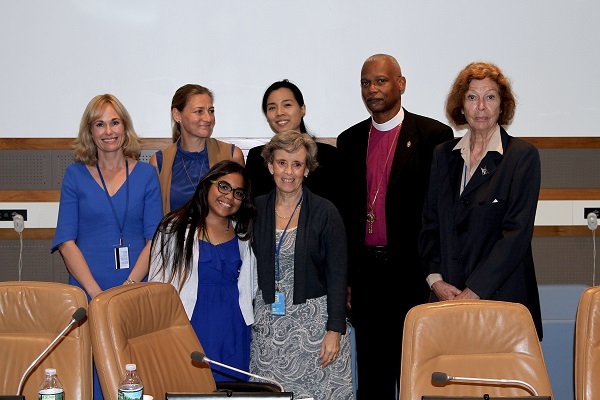 The launch, co-organized with the Permanent Missions to the United Nations of Chile, Sweden and Thailand brought together a youth advocate for children’s rights, high-level child-rights advocates, including a representative of the Global Network of Religions for Children, the Chair of the Committee on the Rights of the Child, and the Ombuds for Children of Norway. The publication Celebrating Childhood: A journey to end violence against children is inspired by personal stories and inspiring messages that capture the achievements and dreams of remarkable people - from all regions of the world, of all ages and backgrounds, from visionary leaders from all walks of life to child rights defenders, scholars, artists, young advocates and other tireless Ambassadors the protection of children. “For millions of children, life is defined by two words: fear and pain! For them the vision of Agenda 2030 of a world free from violence remains distant and illusory. This book is therefore a call to action: to transform the continuum of violence surrounding children’s lives into a continuum of protection of their fundamental rights. States need to play a leading role. But change starts with each one of us. And we can all become the change we want to see!” said SRSG Santos Pais. Moreover, the book is a demonstration of children’s resilience and sense of hope for the future: “Even in the most desperate of situations, children reveal hope for a better world and determination to achieve lasting change – resilient and generous, they inspire us with their unshakable vision of a world of peace and non-violence. As one young advocate stresses in the book, “our neighborhood is a ghetto of violence; but united we will be stronger and education can become our roof; in life, peace is what we want!” added SRSG Santos Pais. Celebrating Childhood acknowledges the significant progress that has been made over recent years towards the realization of children’s rights and their protection from violence. But is also a sharp reminder of the many challenges that persist.